The Career Development Center aims to assist students in their search for internships, grad school programs and employment options during and after their experience at Mars Hill University. 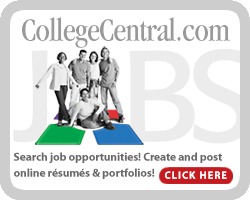 If you want to explore more in depth your personal interests, talents and outlook, go to one of the many resources at this site, such as FOCUS2, and CollegeCentral.com’s jobs database and preparation resource. For academic internships registration at Mars Hill University, visit the Internships pages. See links at left, or for CollegeCentral, you may also click on the red button at right. I encourage you to call or visit my office in Marshbanks Hall with questions, suggestions and comments. We are working to improve the range of services and resources available to you all the time, and your input on your particular needs is always welcome. Follow us on Facebook for updates on job and internship opportunities, upcoming events, career news and tips on preparing for your own success in the world of work! Looking for jobs, internships and career events? Visit CollegeCentral.com! FOCUS is a career exploration and education planning system. Research results cited by the American Psychological Association and the University of Michigan showed that Focus is “most recommended by career counselors, is simple and easy to use, has more of a focus on the user, faster to use, most affordable, comprehensive, and great support from the Career Dimensions staff”. (per FOCUS) A NACE survey showed that Focus is one of the top three most used systems. For the password please send us an email. Do you have a job or internship position that you would like to advertise to our students? Please register (free of charge to you) in our jobs, internships and volunteer opportunities database, where you may post and update opportunities directly online. All MHU students and alumni have direct access to job postings in this online system. For more information, or if you need assistance with this process, send an email to career@mhu.edu. You may also post jobs to our Facebook page. Employers in NC by Major – Find out who hires people with your major in North Carolina, or register for free to find employers nationwide – and all about where they are located. Career Match – Discover cool careers, connect with inspiring people, and share your ideas and questions. Career Perfect – Find out what types of careers might be right for you. Gaining a job that suits your career and lifestyle goals is more than simply applying to a few jobs on search engines, or responding to advertisements! LinkedIn Leverage a worldwide professional network to build relationships and connect with opportunities. How To Email Your Resume To Get More Job Offers (Examples). Public Health Careers – In-depth public health career information in one place, including salary tools, career path timelines, and job resources. Also helpful is a guide to online Master in Public Health options. Social Work is one of the fasters growing occupational fields in the country. Athlete Network is a jobs and internships network for athletes. The site works similar to LinkedIn, ensuring both athletes and employers are able to connect with each other. Hundreds of jobs listed by the National Employment Bulletin for the Arts, updated every three business days. Five distinct categories: Administrative, Artistic, Production/Design, Career Development and Education. Includes summer jobs, internships, festivals, schools, art centers, dance and opera companies, museums, orchestras, commercial organizations, etc., etc. Connects candidates with employers who are proactive in their quest to create a diverse workforce. General Job Search databases – national and international! Information about exciting job opportunities abroad: be a dolphin trainer in Mexico, a whale watching guide, a teacher in New Zealand, something you’ve never dreamed of before but may just be what you’re looking for! Search by state and city to find a variety of jobs in the local area you are interested in.